The observation was made that my cooking whims are directly influenced by the music I happen to be listening to at the time. Since my latest iTunes downloads are a couple of songs from Khaled (“Aicha” and “Didi”, my earworms for the month of July), it was no surprised that I went into full-on Middle Eastern Food mode. With all the hot weather we’ve been experiencing, it only made sense that I want to cook a cuisine that incorporates plenty of fresh vegetables, herbs, and cooling yogurt sauce. 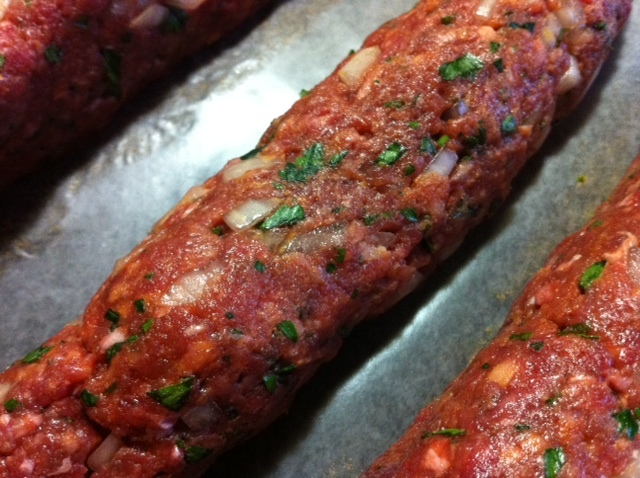 On Friday night, I made Armenian Lule Kebabs – a dish that they serve at my neighborhood Middle Eastern restaurant, La Mediteranee. Line a baking sheet with parchment or wax paper. Using your hands, mix all ingredients together in a large bowl just until combined (overmixing may toughen the meat). Gently squeeze meat around 10-in. metal skewers to form log-shaped kebabs, each about 8 in. long. 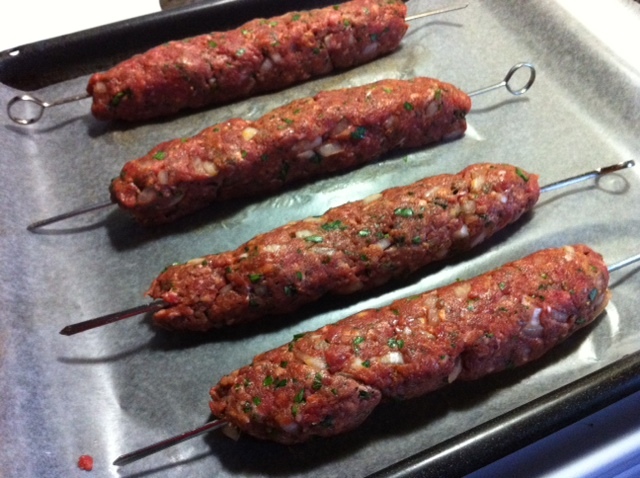 Put kebabs on baking sheet. Cover sheet with plastic wrap and, if you have time, chill 30 minutes to let flavors meld and firm up meat. Prepare a gas or charcoal grill for high heat (450° to 550°; you can hold your hand 5 in. above cooking grate only 2 to 4 seconds) and grill kebabs, turning twice, until grill marks appear and meat feels firm, approximately 8 minutes total. Sprinkle with parsley. I followed the recipe above, more or less, but I made sure to “test cook” a small piece of the meat mixture in a non-stick skillet to make sure it was seasoned to my liking. My first test piece needed salt, so I upped the amount of salt I used and tried again until it tasted right. I served the kebabs on a bed of rice pilaf (from a box, admittedly), and a salad of red onion, tomato, and cucumber with a lemon-parsley dressing. I also made some baba ganoush from scratch, and topped it all off with a piece of flatbread and a side of tzaziki. The above recipe makes about 8 big kebabs.